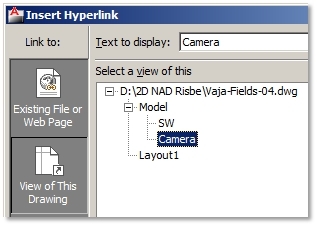 Using Hyperlinks you can connect to web pages, open other documents and display saved views directly from your drawing using just one click (Ctrl+click). 7. Specify insertion point of hyperlink. 9. Specify insertion point of hyperlink. 1. Save views of your 3D model (Named Views). 5. Specify insertion point of Hyperlink. If your drawing behaves strangely, e.g., takes a long time to open or runs slow, this could be a sign that the file is damaged. You can try to fix errors using two AutoCAD auditing tools; however it is not necessary that they will be successful. Application menu / Drawing Utilities / Audit / Confirm Yes to fix any detected errors. Press F2 (Text Window) to see the fixing report, how many errors were found and fixed. It is recommended you don’t continue your work in the same drawing. Save it as a different drawing! You can see the fixing report, how many errors were found and fixed in a dialog box or Text Window. When working with large drawings, it is quite likely that you will create a pile of unused Blocks, Layers, various Styles, etc. that you don’t use. If everything works fine, you will have no problem to continue with your drawing, but when it starts to respond slowly or its file size becomes too big, it is recommendable to clean up these unused items. 3. Click an item name, e.g. Blocks to purge blocks only. 4. 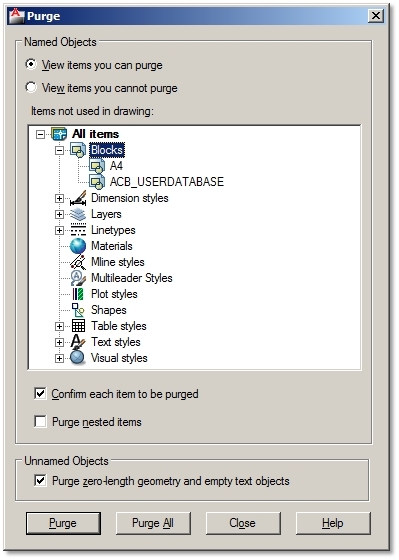 Purge All button – purges all items in your drawing. 5. Confirm Purge dialog box – confirm purging one or all chosen items. 6. Purge zero-length geometry and empty text objects – erases invisible text, e.g. text space only, and geometry with 0 length. Don´t purge all items if you still plan to work on your drawing. If you need a purged dimension style, you will have to re-create it. Certain items are related to other unused items. Purging one enables to purge the other, e.g. purge unused blocks first to release and purge unused Layers. - Many people can work on different sections of the same project at the same time. - You can see a complete project in your active drawing; thereby avoid any mistakes or collisions. - File sizes with X-ref drawings are smaller than the one where sections are inserted as blocks. - You always see the latest version of your X-ref file in your active drawing without re-attaching it. - When your coworker saves changes to your X-ref file, you simply get a notification to update them. - X-refs can be attached, removed or inserted to your active file at any time. 2. Browse for referenced file. If X-ref drawings used the same drawing units, set Scale to 1. It is recommended that all X-ref files refer to the same base point; thereby insertion point. Full path – X-ref file is read from an absolute path (the file must be located in the same folder order). 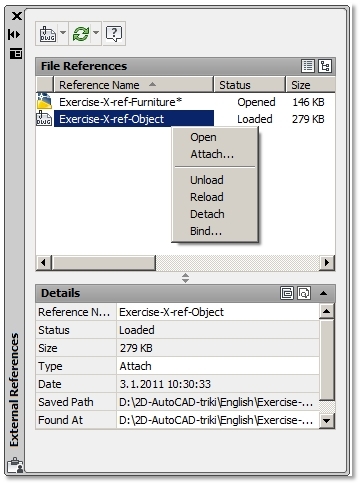 Relative path – remembers the folder order between the X-ref and active file. You can move the project folder to a different folder or hard drive, but you shouldn’t move one of the files to a different folder. 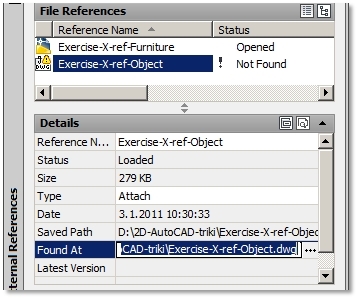 No path – X-ref and active file must be located in the same folder. 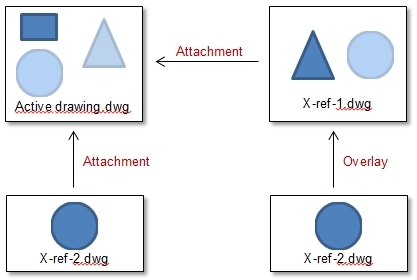 Attachment – a regular X-ref attachment. Overlay – choose this option when you know that this drawing will be X-referenced to a different drawing which will contain the same X-referenced drawing. You will avoid duplicating X-referenced files. You can directly open your X-ref file, make some changes and save them to X-ref´s root file. Saved changes will also be seen in your active drawing. Unloaded X-ref file isn’t seen in your active drawing, but the path to it remains. If you need to restore it, just click Reload. The drawing with unloaded X-refs works much faster and uses less memory. Deleting an X-ref is the same as unloading it. Detach command deletes an X-ref file permanently. Bind command inserts an X-ref file as a block. Path to its root file is broken. If you want to update it, you will have to re-insert it. You can choose between two Bind types. Bind type keeps all original Layer and Block names from the X-ref file. Duplicates are automatically renamed. Insert type combines the same Layer and Block names. If you move your drawing files to other folders, the path to your X-ref file in your drawing gets broken. You don’t have to re-attach your X-ref file again. Just simply define its new path. 1. Open External Reference palette. 2. Click the name of the lost X-ref file path. 3. Under Details options click Found At and click the 3-dotted button to browse for your X-referenced file. 4. Once the path is found, X-ref will load automatically. 1. File / Open - The easiest and least confusing way is to simply Open your X-ref file, make and save changes. 2. External Reference palette / Right-click on the name of X-ref file / Open. X-ref drawing is opened inside your active drawing. As you can see the rest of your active drawing it is easier to make those changes in your X-ref drawing that depend on geometry in your active file. For comparison, if you open your X-ref file with an Open command, you will only see the geometry of your X-ref drawing and none from your active file. Extra tip: If you work on the project with your coworkers, you might receive a notification that you cannot open your X-ref file as it is Read-only. This means that someone in your working group has opened this file before you did. This is a safety precaution, and you will not be able to save changes to this File until your coworker closes it first. 2. Specify Clipping Boundary – pre-drawn Polyline, Polygonal or Rectangular. 3. 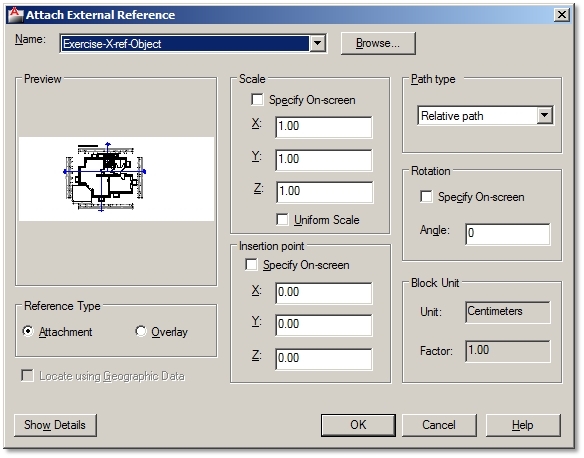 Select X-ref drawing / Contextual Ribbon External Reference / Clipping / Remove Clipping – Restores clipped X-ref drawing. Layers that belong to X-ref drawing are automatically renamed by adding a file name as a prefix in front of a layer name. Layer organization in an active drawing is therefore not disturbed. 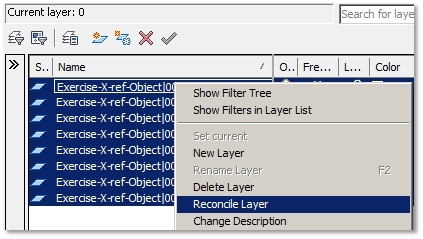 You can set properties to X-referenced layers, but you cannot make them current. When you attach an X-ref drawing you might get a notification (bottom right corner) about new unknown or unreconciled layers in your drawing. To some this information seems valuable, but many may find it annoying if messages to reconcile new layers keep popping up during various operations, e.g. before plotting. To resolve this you can either reconcile new layers or turn off layer evaluation control. 1. Click View unreconciled new layers in Layer Properties Manager. 2. Select all unreconciled layers / Right-click / Choose Reconcile Layer from the menu. 3. Set the system variable LAYEREVALCTL to 0.